Information overload is one of the biggest downsides of the information age: sometimes it seems like there are so many available resources, data, information, and advice, it can be hard to know where to get started. 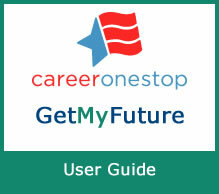 CareerOneStop’s GetMyFuture website for young adults is no exception—it provides a wealth of information to help young people explore careers, plan and pursue their education, and launch an effective job search. But both young users and the counselors or others who work with them can have trouble knowing what resources to look at first. ‹ Thinking about moving for work?